Forward Chandler Stephenson will play in captain Alex Ovechkin‘s spot on the top line with center Nicklas Backstrom and forward T.J. Oshie and forward Dmitrij Jaskin will return after being a healthy scratch in the Washington Capitals’ last game, a 6-3 loss at the Toronto Maple Leafs on January 23, when the team hosts the Calgary Flames (can be seen on NBC Sports Washington) at 7 PM on Friday night. Despite Ovechkin being out, forward Andre Burakovsky will skate on the fourth-line against the Flames. Center Nic Dowd will draw into the lineup tonight while center Travis Boyd will come out. Goaltender Mike Smith, who is 14-9-1 with a save percentage of .888, a goals-against average of 3.04, and two shutouts and lost the Flames’ starting job to David Rittich this season, was the first goalie off at the Flames’ morning skate, indicating that he will start against the Caps on Friday. He is 4-8-2 with a save percentage of .895, a goals-against average of 3.20, and one shutout in his career against the Capitals. He made 24 saves in the Capitals’ 4-3 shootout win over the Flames on October 27 at the Scotiabank Saddledome, the first time the two teams met this season. 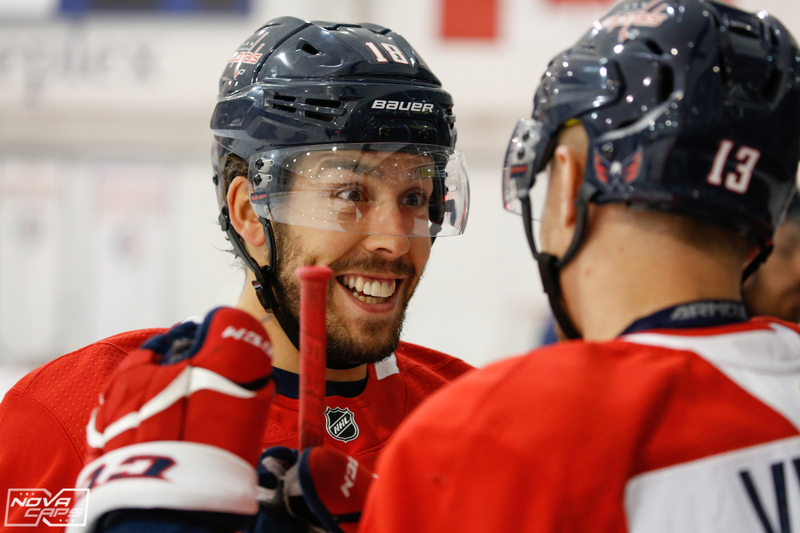 This entry was posted in Lineups, Morning Skate, News, Washington Capitals and tagged Alex Ovechkin, Andre Burakovsky, Chandler Stephenson, Dmitrij Jaskin, Harrison Brown, Morning Skate, News, Nic Dowd, Travis Boyd, Washington Capitals. Bookmark the permalink. Well finally the second half of the season commences tonight at Capital One Arena against the Calgary Flames. No Ovechkin for tonight’s game. Suspended one game for failing to show up for the Allstar game. Not sure if this made the many fans of the NHL happy. I for one still undecided if this was the appropriate move by Ovie. He has looked a bit sluggishly lately! With that said the intensity of the Caps players needs to pick up on the starting tonight. They seem to be disorganized on the defensive side of the ice. Some D-men trying to do to much covering up for others mistakes. I notice a dip in their play upon Orpiks return to the lineup. It’s possible the team ran out of gas near the end of the first half of the season due to playing hockey in June last season. Yes the team finally delivered the Stanley Cup to its fans of the DMV area. Do the young hockey fans have to wait another 50 years for another Cup Final run in D.C.